Just (loading) left to join the May Circle! Products / Selenite Iceberg - 4"
A high-vibration stone; traditionally used for scrying or cleansing, selenite is said to inhabit the space between light and matter. 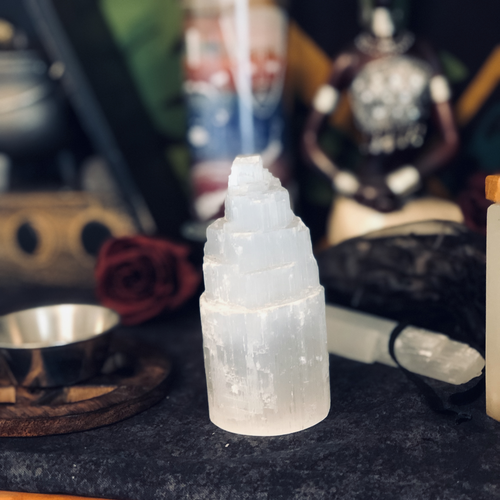 Selenite is a powerful disperser and stabilizer for erratic emotions and brings about a conscious understanding of what is taking place on a subconscious level. This crystal can be used to create a protective grid and a large piece placed in the home ensures a peaceful atmosphere and prevents negative energies from influencing the mind. We love to hear from our Circle Members! Send a message to our Founder and resident Hedge Witch.